Competition, 2011. 2nd Prize, in collab with Mark Balzar. Landscape has had a traditionally immense influence on Finland’s architecture. The expanse of the land and the low density of settlement make the variations of this connection seem inexhaustible. Architectural surveys such as “Build Landscape” attest it (in this case directly through the title). In fact, perhaps the strongest Finnish contribution to Modernism was Aalto’s blur of the boundary between designed landscape and landscaped buildings, an implicit critique of the autonomous architectural object. 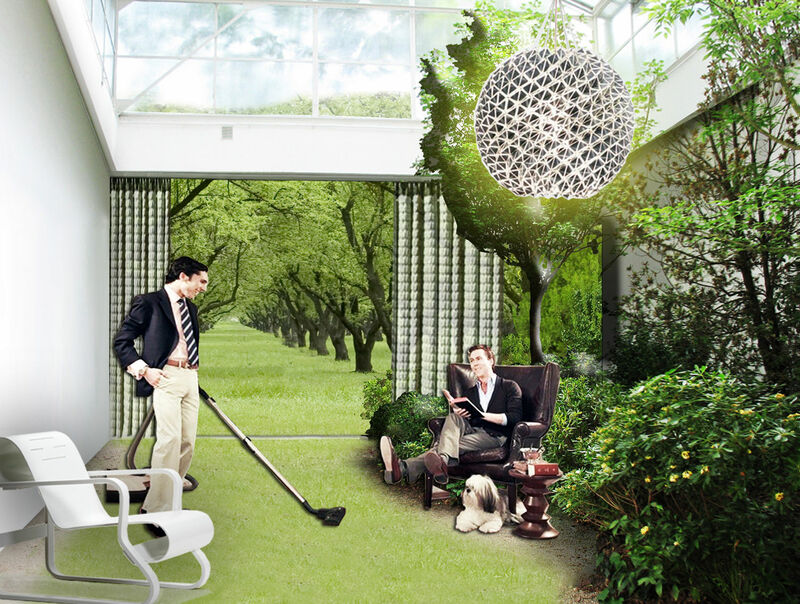 The boundary to landscape is evolving. The shift from a hard compact wall of the fortified cities to the infinite blurred contour of sprawl traces centuries of changing social organization. After the mostly unattainable vision of Garden Cities, we follow the emergence of a more specific goal: living on the edge between complex urban amenities and immediate rich ecosystems. In geometrical terms: a dense and limited urban area, with an infinite boundary. 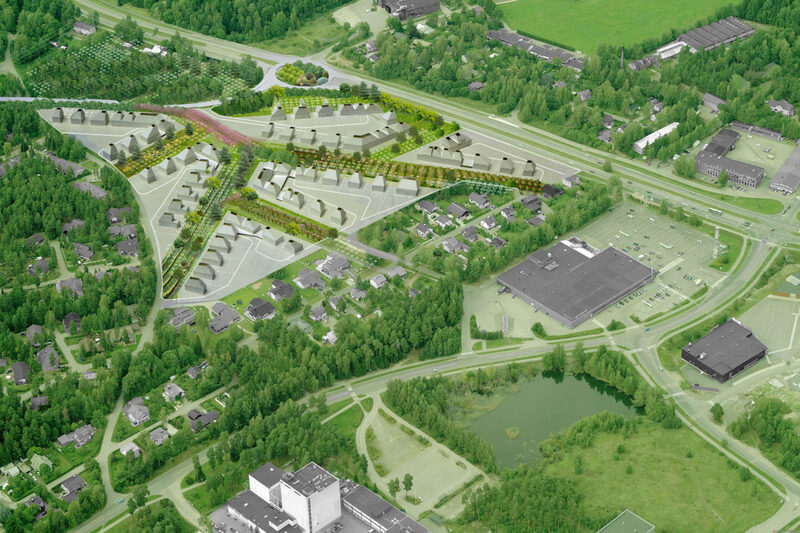 For Turku, we envision such a boundary by proposing to pull both the surrounding landscape and urban pockets into the site. Never do these areas intersect. However, we carefully extend and design their interface, creating a blurred transition from one to the other. On one side are continuously branching corridors of vegetation. We named them the Orchard Avenues. In a reversal, the other side becomes access: the Urban Courts. In between, a gradient of various house types creates a visually permeable membrane. The site’s expected low density presents a dilemma: could clear identity emerge from such a thin spread of constructions? While buildings alone may not be up to the task, we explored the opportunity of creating a recognizable spatial structure through their connection with landscape. This connection creates boundaries different from the hard edge of pure architecture. We propose to work with a gradient transition: from the public poles of the Courts and Avenues in steps of increasing privacy and spatial clustering towards the private strings of houses. By pulling the context into the project’s area, we smooth out the sharp delimitations created by its four surrounding roads. The northern recreation area is connected directly into the main branch of the Orchard Avenues network through a special paving of Haritun Puistotie. Through Kärikkatu, the network links directly to the shopping area and to the water retention basin. 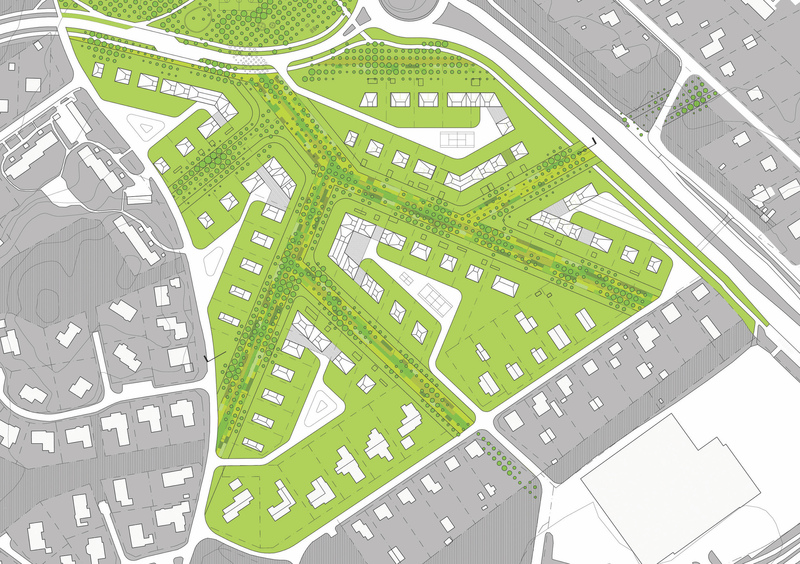 Secondary “avenues” link the site to interstitial patches of nature between surrounding properties. A wave topography limits the noise pollution from Uudenmaantie. The project merges two adjacent types of suburbia: the big box shopping malls to the south and the small house boxes around are morphed into housing clusters with a more efficient land use.